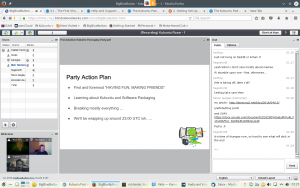 Last night ( Friday 15th April, 19:00 UTC ) we held the second of our Kubuntu packaging parties. Using the new conference server provided by BigBlueButton ( BBB ), and things worked like a dream. Our last party was difficult to orchestrate as we were operating across multiple channels. Internet Relay Chat, Mumble voice server, and Google Hangouts. Our BBB server provides all three of those functions and allows each user to decide which of each they prefer to use. It was a brilliant party, with a great atmosphere. Something which is not easy to achieve in a purely online setting. Fred Dixon ( Product Manager at Big Blue Button ) had told us that BBB could host up to 100 people in each conference Room, and we have 4 Rooms ! In aggregate we estimated around 40 people came to the party, with 18 in Room 1 at its peak occupancy. The theme for the party was packaging, although the primary objective was to “Make Friends, and Have Fun !” The packaging didn’t really hit the ground running, and as the night went on, it took more and more of a back seat. The bottom line being that once again we didn’t get further than “Getting Setup”. It became clear that Kubuntu Parties are definitely a great idea, but the focus must be on “Making Friends and Having Fun !”. The party atmosphere takes on a life of it’s own, with the conversation flowing in different directions, based upon who is talking, and who has recently arrived. We felt that this very loose format of welcoming guests, and getting them involved in the conversation, and in particular focusing on open questions that invite them to introduce their own topics, works best. Having a single presenter controlling BBB, interacting with guests, running the packaging exercises, and screen sharing is too much for one person. The next party ( Friday 20th May 19:00 UTC ) will involve a greater number of hosts. Who will share responsibility between Host, Screencast demo’s, managing the room and driving invitations via social media. Both parties were allowed to overrun and take their own directions. The first party resulted in our discovering and being given Big Blue Button. Party 2, took on a similar un-conference direction and style. However, this allows the party to fizzle out in a sparkle rather than ending with the fireworks, and leaving people wanting more. We’ll change this for the next event closing the party on time, but allowing 30 minutes to say farewell and wave our guests off. Sharing knowledge is still an important requirement for growing and developing a healthy Kubuntu community, and we are looking at 2 potential ways to do this. One way to do this would be separate Kubuntu Dojo learning events, this is appealing as Big Blue Button is designed specifically for on-line education. Our other way of approaching this, is to introduce Kubuntu Dojo as a segment section of the Kubuntu Podcast. This too has some nice advantages, one in particular is the ability to edit out that specific section, and post as a standalone video. This would build as a library of easy to access multimedia based knowledge. Kubuntu Parties are fantastic fun, they work! They attract a wide audience from beyond the Kubuntu community. At this party we attracted party goers from; UBports project, Ubuntu, Lubuntu, Devon and Cornwall Linux User Group and of course Kubuntu. Invite your friends, and share this news on your social networks, IRC and the wider community.